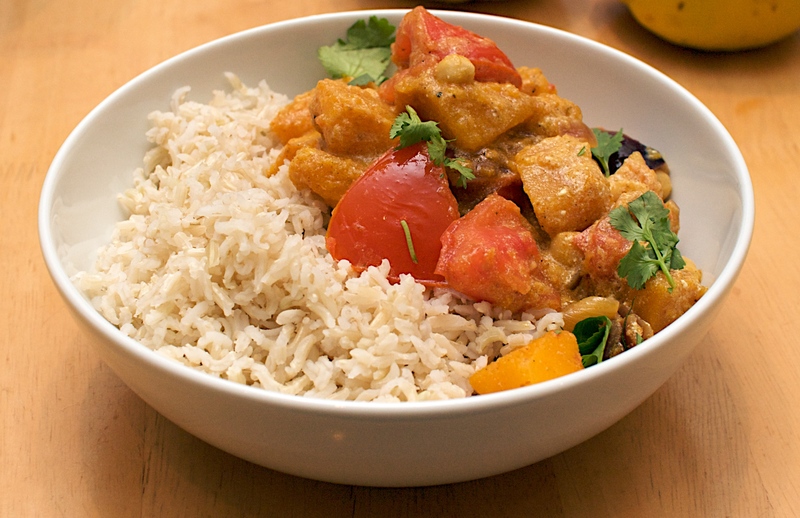 This is a handy mid-week curry with nothing like the calorie and fat content of an Indian take-away! Cook the rice in boiling salted water according to the instructions on the pack. Meanwhile, heat the oil in a large frying pan and cook the squash for a few minutes until lightly browned. Add the onion and the curry paste and fry for another 3 or 4 minutes. Pour over the stock, then cover and simmer for 15-20 minutes, or until the squash is tender. Add the tomatoes and chickpeas, then gently cook for a few minutes, until the tomatoes slightly soften. Take off the heat and stir through the yogurt and coriander. Serve with the rice.